 » 2019 » Archive by month "March"
Is not always easy for us to see. When we don’t realise, the thankfulness we lack. But we don’t realise, until we miss it the most. No matter our age, or how far we roam. Remember St. Annes (or your school) who made you who you are. Category: Media Team, Literacy | Comments Off on The Reason Why School Is A Safe Place to Be! On Wednesday the 12th December the school choir went to a carol service in St. Anne’s Church. It was on quite late, so it was very dark outside, but the church was bright with lights and candles. The choir sang two songs. The first one was “Night Of Silence” and the second song was “In A Stable”. Third and Forth class were singing in the choir. Mr Dunne, Ms Maguire and Ms Elmes were the leaders of the choir. Father John led us in prayer. I am part of the choir and I love it. We really enjoy choir practice. We have to work really hard to learn all the songs but it is worth it. Scoil Mhuire and the church choir sang there too. We also recorded these songs. With Mr Dunne’s guitar playing, Ms Maguire’s piano playing, Ms Elmes’ beautiful conducting and of course the choir, the night was a great success. Written by Mairead and Pearl. Category: Media Team, Music | Comments Off on The Choir’s Big Night! Category: Media Team, Literacy | Comments Off on Oh I Really Love Bees! Q. Where in the school do you teach your classes? A. In the junior and senior yard. Q. What skills do they learn? A. They learn the solo, pick up, kick pass, hand pass, high catch, chest catch and the punt kick. Q. Are the skills hard, medium or easy level? A. They are medium level. Q. Do you do any warm up games? A. Yes, flush the toilet, stuck in the mud, the traffic light game and tag. Q. Are your classes good at it? A. Yes. Very good at it. Q. Do they get lots of exercise? A. They do, most of the drills involve moving. Q. What is your favourite skill to teach? Q. Do they enjoy it? A. Yes, they do enjoy it. Q. Do you enjoy it? A. Yes, it is great fun. It is great to see boys and girls learning new skills whilst having fun. It’s great to see so many boys and girls from St. Anne’s school playing for Shankill G.A.A club during the week and during the weekend. Category: Media Team, Physical Education | Comments Off on Interview with Steve Davis, GAA Ballskills Coach in St Anne’s. In 3rd class we have started ukulele lessons. The ukulele is a 4 stringed instrument. It has 12 frets. We are learning Shotgun by George Ezra. It is one of our favourite songs. The beat of the song goes like cat-kit cat-kit. We are also learning how to tune our ukuleles. You can compare your ukulele to a fully tuned one and try to match the notes, or you can use a tuner or a tuning app. I asked our teacher Aidan about teaching ukulele and he said he has always loved music and teaching music to other people. We have been learning beat-boxing and the C cord. We will soon learn the A Minor cord. We all like learning ukulele as it is fun and not too hard. We all also like to practice on air-guitars. It is great! Category: Media Team, Music | Comments Off on Ukulele in Third Class! An Update on the End of Year Show! The End of Year Show – a big tradition that takes place in our school towards (well you guessed it) the end of the year. And preparation for this year’s show has begun! The parts for the show have been given out and dancing will our talented dance teacher Catherine Casey has begun. So with all of us here working hard let’s hope that this year’s show will be one to remember! Category: Media Team | Comments Off on An Update on the End of Year Show! The Student Council have been fundraising for over two years to buy new toys and equipment for the yard. The first of their purchases came in February 2019. They purchased goals for the yard. These were put up by Ogie and are being enjoyed by the classes in the senior yard. 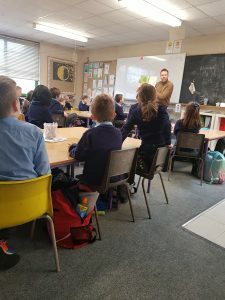 The Student Council have had many fundrasing events recently. They had a very successful talent show in 2018. This talent show was enjoyable for all who came to see it. The Student Council have been working to get toys for the yard for the junior classes too. They have asked all classes for donations for Duplo Lego from home. They are also planning more fundraising events this year! Category: Media Team | Comments Off on Student Council Fundraising! News from Ms. Rigby’s First Class! We’ve once again had a busy few weeks in room 3. We had the most wonderful day for Grandparents day. We enjoyed performing and also asking loads of questions. We also performed at assembly. Our performance was all about the extra homework we were given. We weren’t too impressed when Ms Rigby gave us extra homework. The extra homework was to smile a little bit more. We’ve also started group work projects. We found it a little tricky at first but we are getting much better. 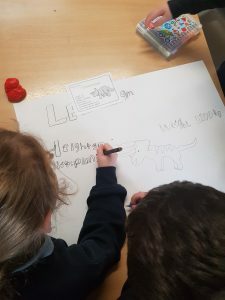 We have been working together to make presentations on different dinosaurs for the whole class. We’ll show you them when they are done. We also had a great week for world book day. We were lucky enough to have Mr Fingleton read to us! We thought the books were very funny! Category: First Class, Literacy, S.E.S.E | Comments Off on News from Ms. Rigby’s First Class! 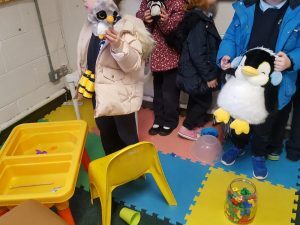 News from Ms. Black’s Junior Infants! 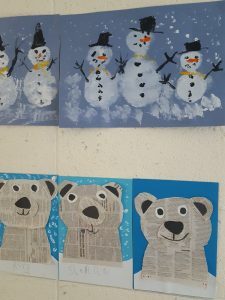 This month we learned about Polar bears and other arctic animals, we did very cool artwork. We were learning all about the weather and we kept a weather journal for a week to record the different types of weather each day. 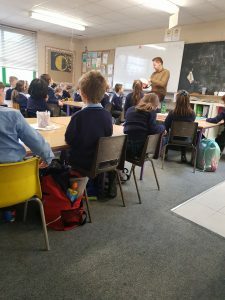 We learned lots about aimsir in gaeilge. We made great symbols of sunshine, cloud, rain, snow and wind for our weather forecast corner. 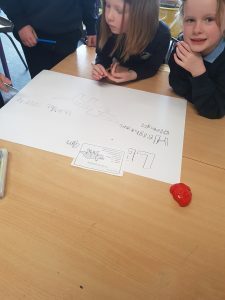 We took turns to forecast the weather all over Ireland. In maths we are learning the story of 5 and we did a survey on eye colour in our class and showed the results on a pictogram. Daily reading has started and we are really excited to read a different book everyday. 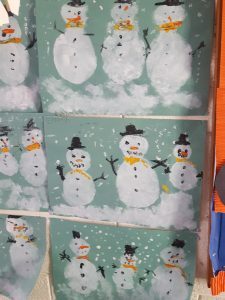 Category: Junior Infants, Aistear, S.E.S.E, Art | Comments Off on News from Ms. Black’s Junior Infants! 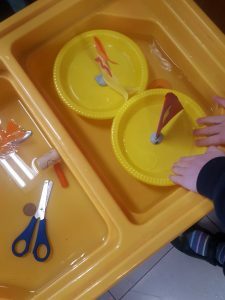 News from Ms. Woods’ Junior Infants! 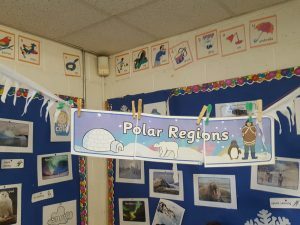 This month we went to the polar regions with our Aistear. 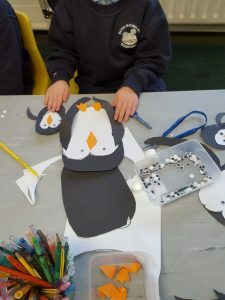 We made penguins and polar bears and had great fun finding out about Tom Crean and all his adventures in Antartica. 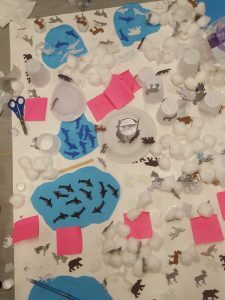 We set up camp and went fishing in the arctic and followed Tom Crean’s example and went to explore the South pole. We looked at the emperor penguin and were amazed to see that the male penguin minds the eggs. We spent a lot of time learning our jolly phonics sounds and are now able to blend them to form words. We are learning the story of five in Maths.We sang, did poetry and lots of irish.We had a great time! 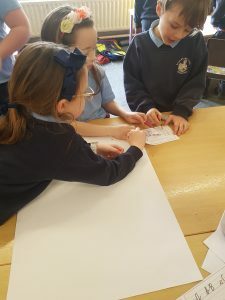 Category: Junior Infants, Aistear, S.E.S.E, Art | Comments Off on News from Ms. Woods’ Junior Infants!